Hey guys, meet your new go-to steak dinner. I could not be more excited to share this recipe with you all, it’s one of the best steak recipes I’ve created! 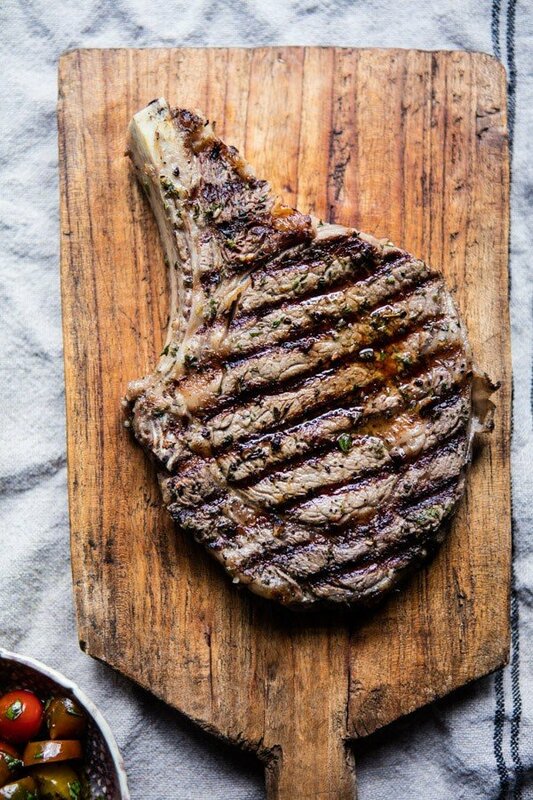 Typically, steak doesn’t need a recipe. Throw a little salt and pepper on a good cut of meat and grill it up. But sometimes you just want something a little more fanciful and fun, and when that time comes, this is your recipe. 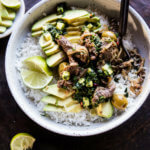 This recipe is almost as simple as adding salt and pepper, but about a million times more flavorful and delicious. Plus you’ll get major bonus points from anyone you make it for, whether it’s your mom, your boyfriend, girlfriend, whomever…they’re going to love you that much more. This is just one of those recipes. The kind to always have in your back pocket for when you are in need of a quick, simple and easy, but yet super impressive meal. What makes this steak so special? A few things, first the steak gets marinated in fresh rosemary, thyme, and garlic. Also known as the holy grail of Tuscan herbs…ok I totally made that up, but it seems fitting so I’m going with it! 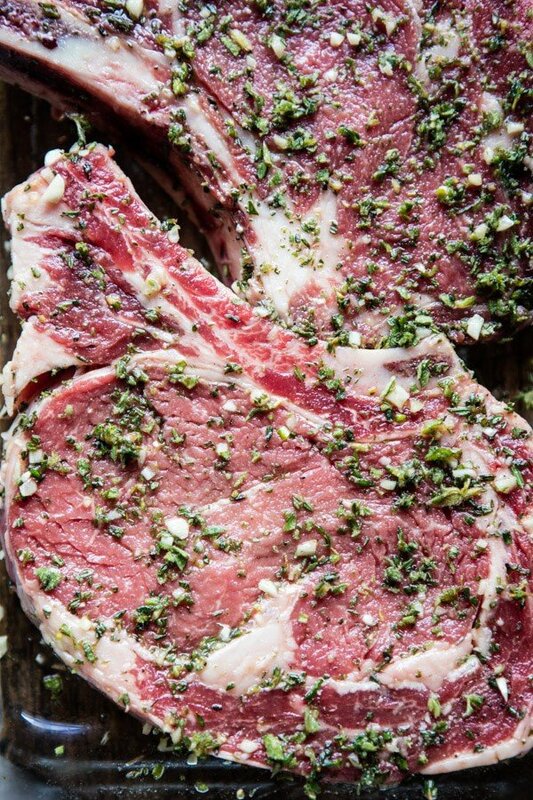 This combo of herbs and garlic on a steak is just perfection beyond words. I know it’s simple, but the added flavors make a huge difference and add so much to a simple grilled rib-eye steak. 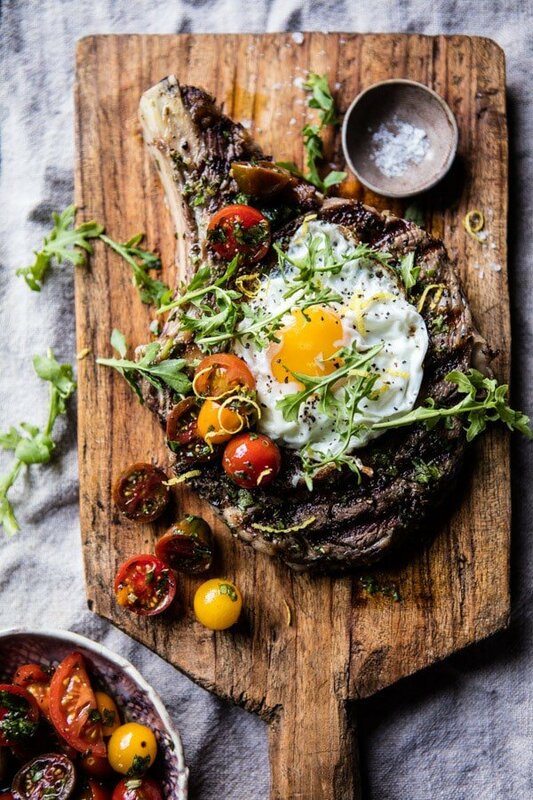 But that’s not all, aside from the seasonings, which are important, there’s also a fried egg, marinated cherry tomatoes, and a drizzle of herb oil to finish off the steak right. 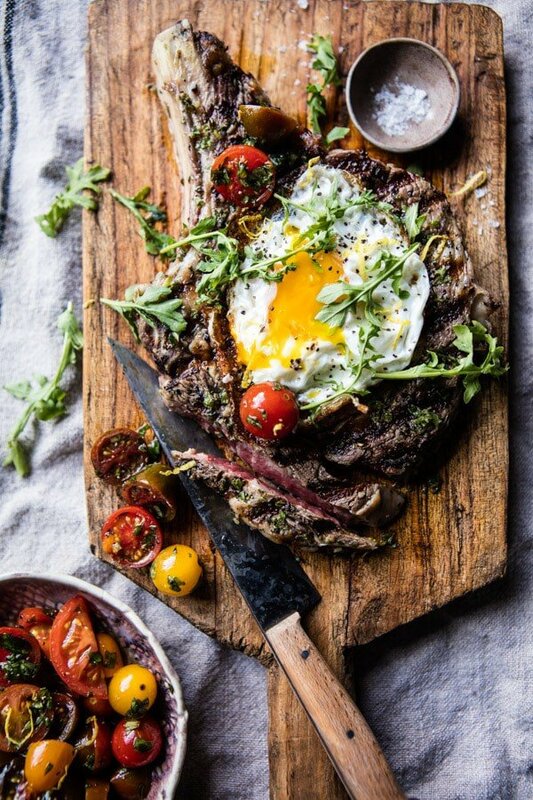 The fried egg on a steak is super traditional in Tuscany and when I read about this concept, I knew I had to recreate it. Again, when is an egg ever a bad idea? I always find it elevates a dish. 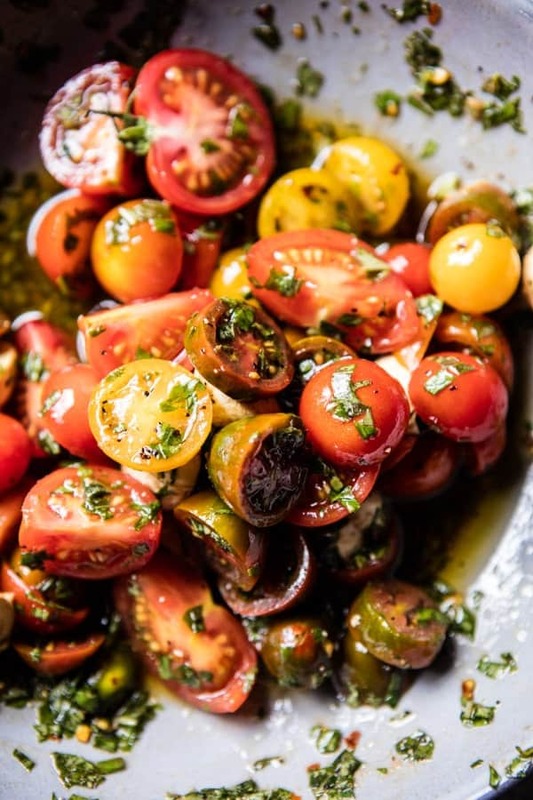 The marinated cherry tomatoes are not traditional, they were a last-minute addition, but they really completed the meal and added a nice pop of color to an otherwise colorless dish. I had a bunch of heirloom cherry tomatoes on hand and I loved the sound of the tomatoes with a Tuscan Style Steak, so I mixed up this recipe from last summer and served it over top the steak. And you guys? It is SO good. 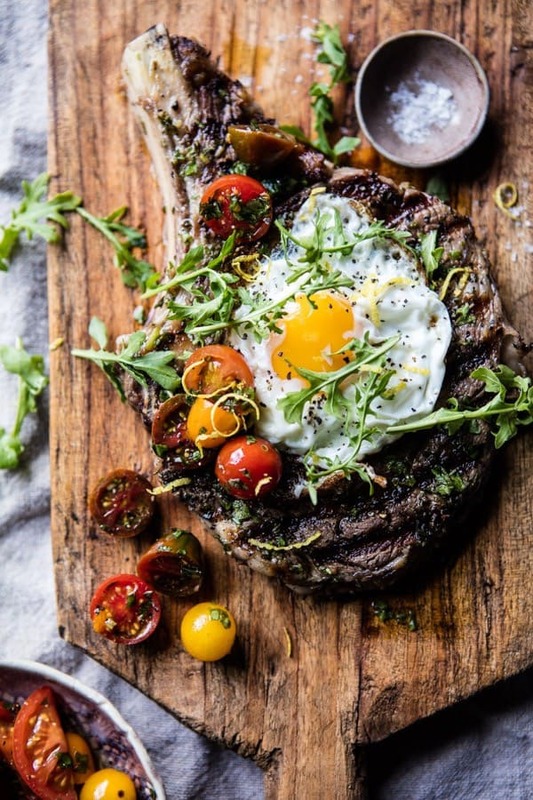 All the flavors together, the rosemary and thyme on the steak, the oregano in the herb oil, the fried eggs, and the sweet, juicy cherry tomatoes. I like to serve this steak with a side of crusty bread and a big green salad. 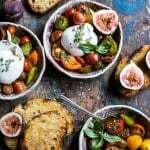 You could also do some kind of potato, but I really like the bread for scooping up the extra cherry tomatoes and any of that drippy fried egg. It’s best if you can marinate the steak overnight, but I’m not going to lie, I’ve made this a few times now and only marinated the steak fifteen minutes or so and it was still great. If you can plan ahead though, marinate the steak overnight. If not, don’t stress too much, just season up the steaks and start grilling. If you’re not a fan of rib-eyes, you can use your favorite cut of meat, but the rib-eyes cook up awesome for this recipe…just sayin’. My intention was for you guys to make this meal for Mother’s Day, but I’m kind of thinking it might just need to be a Wednesday night dinner? After all, test runs are always a great idea, you know, before the real gig on Sunday, right? Tuscan Steak dinner for the win! This steak dinner is so easy to make and is super delicious! 1. Place the steaks in a reusable ziplock bag. Add the olive oil, thyme, rosemary, and garlic. Seal the bag and rub the marinade into the steaks. Refrigerate 1-2 hours, but preferably overnight. 2. Remove the steaks from the fridge 30 minutes prior to grilling. Preheat the grill or a grill pan to high heat. 3. Season the steaks generously with salt and pepper. Sear until your desired doneness is reached, about 5-8 minutes for medium-rare, per side. 4. Remove the steaks and allow to rest 5 minutes. 5. Meanwhile, make the herb oil. In a small bowl, mix together the olive oil, lemon juice + zest, thyme, oregano, salt, and pepper. 6. 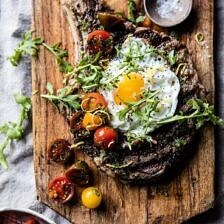 To serve, plate the steaks and top with a fried egg, fresh arugula and the marinated cherry tomatoes. Drizzle with the herb oil. Enjoy! PS. this recipe got five stars all-around! Oh this reminded me of my childhood sooooo much!! Whenever parents took kids out to a restaurant, here in Portugal during the seventies and the eighties – this was before fast food hit our shores – the go to dish for kiddies was always the “Bitoque” a steak with an egg on top! It felt like a trip down memory lane, seeing this! Awh yay! I love when a dish reminds me of my childhood! Sounds so yummy! This looks amazing! My husband will LOVE this! YAY!! So happy you like it, thanks Ashlyn! So delicious, I love the use of egg on top! Wish I was having this for dinner tonight! This is my kind of meal! Thanks Mary Ann! So happy you like it! 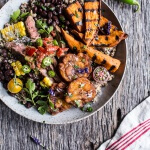 No doubt this is a go-to summer dinner! Can’t wait to try it. Yes! Hope you love it Matt! I agree, adding an egg to a meal just makes it so much better. But an egg on top of a steak? For dinner? How had I never heard/ thought of that before?!? 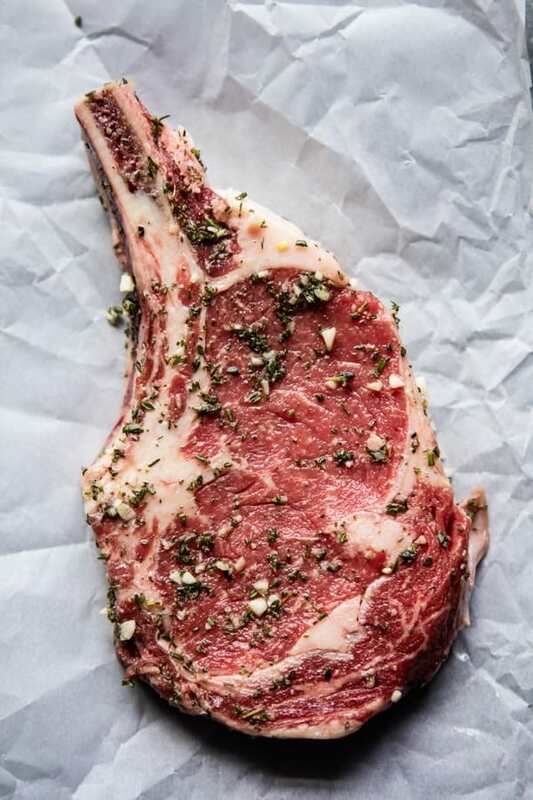 I think this Tuscan steak will need to be made asap, because it looks and sounds *yum!*. …and now I’m sad because winter is fast approaching here in Australia and chilly 2 degree evenings really don’t support the idea of standing outside at the BBQ grilling steaks. Ah well, I guess the stove top griddle pan will have to do… first world steak problems! 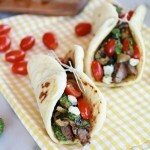 Those marinated cherry tomatoes are SO GORGEOUS!! Seriously can’t get over this! Love all the flavors going on! Thank you so much, hope you love making it! There’s nothing I love more than a great steak! love what you did here! Delicious! This is so perfect for summer. Absolutely love eggs and tomatoes. Delish!! Yes! So do I! Thank you! Thank you! The eggs my favorite part too! Great! I hope she loves it! I loved this steak recipe. Very tasty. I love tomatoes! I tried it last night. It was tasty. Thanks for sharing.